Here is the “Last Ice” around the corner from Lloyd’s beach. There was a fair amount of this stuff blown down my way, so although the lake was “Navigable” by Coast Guard standards the ice was not all out. My “Ice Out” time and date was Independence day April 19 at 3:47 PM (when observed from Rte 17). 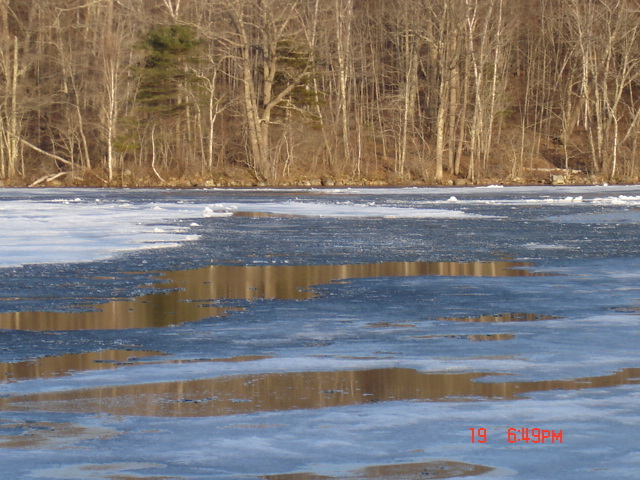 On the morning of April 19 there were a few independent patches of ice cruising around the lake in light and variable breezes, by afternoon only small pieces of old snow covered ice were jammed in leeward corners and by morning April 21 after heavy rains there was no ice seen anywhere, true ICE OUT. Long hot summer follows. Note shiny water, grey ice, dark gray broken up ice cubes,and snow covered ice. The ice cubes tend to stay together, surface tension perhaps.